See You at The Biggest Homeschool Conference in the Philippines! When we started homeschooling last June, I thought it would be a breeze for me. I have almost two decades of experience as an academic tutor(yes, I’m THAT old!) . I’ve taught multi-level students in all academic subjects. My kids are still in grade school, so, how hard could that be, right? Well, our first quarter was a humbling experience for me. I think I learned more from it than my kids did. I was too concerned about meeting the academic requirements that I tried to replicate traditional school in our homeschooling. We followed the usual school schedule, I had written quizzes and long tests prepared, we read and answered textbooks and worksheets. However, as I met other homeschooling parents both personally and online, I realized that homeschooling wasn’t about bringing “school” in our home. It is about molding our children’s values and character. It is about helping our children discover their potentials. It is about equipping them to be productive members of society. One thing I also realized is how important it is to have support from other homeschooling families. Now, whenever I can, I attend workshops and seminars to further equip myself in my role as a teacher and a mother and to foster friendship with others who have chosen this same path. This month, I will be joining other homeschooling families in the country’s biggest homeschool conference. Whatever stage you are in homeschooling now or whether you’re still contemplating about homeschooling your children, you shouldn’t miss this year’s conference aptly themed “From Roots to Wings: Homeschooling through the Stages”. Bearing the theme in mind, the PHC 2016’s line-up of speakers includes international and local speakers who are passionate homeschooling advocates, and are also experienced homeschoolers. 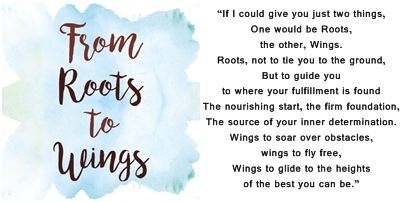 They will inspire participants to provide their children with “roots,” build their foundation, and give them “wings” so they can soar to greater heights. The PHC 2016 also has an amazing line-up of BREAKOUT SESSIONS. New and experienced homeschoolers alike will definitely find something “fit” for their unique homeschooling situation in the practical breakout sessions lined up for the conference. The sessions will cover topics like the ins and outs of homeschooling in the Philippines, laying the foundation in preschool, homeschooling the high school years, and transitioning to and from brick-and-mortar schools, among others. Aside from these, there are also Kids’ Activities, a great Expo, and lots of Raffle Prizes during the conference. There are really so many awesome reasons why you should attend this conference! Register early to avail of the regular rate of P1000, or the group rate of P4500 for 5. Walk-in or on the day payment will be P1200. So, see you on the 22nd of October at the SMX Convention Center, SMX Aura Premier in Taguig City. Registration starts at 7am. The Homeschool Association of the Philippine Islands (HAPI), is a non-stock, non-profit organisation that aims to equip homeschooling groups and organisations in growing the national homeschooling movement. HAPI has partnered with Educating For Life (EFL) to mount the Philippine Homeschool Conference 2016. EFL was founded by homeschooling parents to support families who have courageously decided to take the path less taken in educating their children. How I wish I could attend this event…It’s more fun homeschooling in the Philippines!